Curly-haired ladies know a thing or two about hair care. We put in the time, elbow grease, and patience necessary to handle the sweat and tears that go into taming our manes. Even so, there are still some days where we roll out of bed with barely the energy to brew a cup of coffee much less spend an hour diffusing our hair. If only a magical hair fairy existed to wave her magic wand and make all our hair dreams come true. Since that's not happening anytime soon, it's time for plan B: slaying the DIY route of styling our curly hair with no blow dryer diffuser. Here's exactly how to do it. If you thought the best way to dry curly hair was through a blow dryer or other styling tools, then you've been treating your curls all wrong. Switching things up for a DIY hair diffuser method is something good to try often because too much heat can damage your hair. Rolanda Johnson Wilkerson, Ph.D., a senior beauty scientist for Procter & Gamble explained in an interview to SELF why this is. “When you add too much heat to your hair, you are completely breaking those bonds the same way you would as if you were [chemically] relaxing your hair." 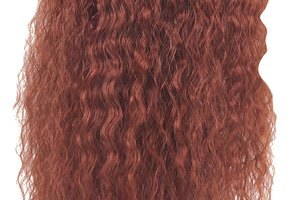 Start with curly-focused products or leave-in conditioner: Since curls can be so temperamental, you might want to apply some product before trying any of the two methods below. This will help your curls at a time when they need it most since no heat will be used, and this can increase the chances of frizz appearing. Use a T-shirt or microfiber towel for the "plop" technique: Yes, it's really called the "plop" method, and many curly-haired gals swear by it. It involves bending at the waist and dropping your hair onto the middle of a T-shirt (100 percent cotton is best) or a microfiber towel and twisting the ends around your hair as you stand back up. Next, you should have both ends of the towel or shirt by your ears in what looks like "sausage rolls." To finish, clip both sides, get some beauty rest, and when you wake up, your curls should be dry, beautiful, and bouncy. 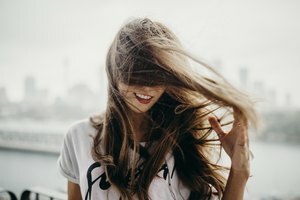 Try the natural "scrunch" method: This hair-drying technique is certainly the easiest, but it will result in hanging around with wet hair for a while. To start, simply bend at the waist so your hair falls down in front of you. Then, using a hair mousse that's good for preventing frizz, dollop a good amount in your palms and scrunch it into the hair, starting at the roots. Keep doing this until you feel like your hair is covered well. After a few hours, your hair will dry naturally, creating a nice shape and style thanks to the mousse. Curly hair presents itself in many forms, including coiled curls that stay very close to the scalp. It's a very stylish look, but if you're looking to elongate your curls, heat isn't the only way to achieve this. 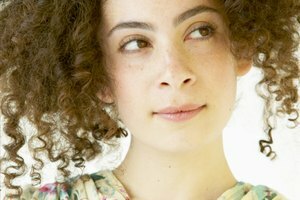 Luckily, it's possible to stretch out your curls the natural way. You could purchase stretch plates, or you could do the pineapple trick that many girls have become obsessed with. It involves grabbing all your hair and plopping it on your head. It should look like a pineapple, hence the name. Instead of making it similar to the plopping method by using a T-shirt or towel, just clip the hair (alligator clips are super durable) and shake it out when you're ready. When done, your curls should have an elongated appearance. Say goodbye to heated tools with these DIY ways to care for your curly tresses. By doing so, you are giving your hair a much-needed break, and you can feel good embracing every bit of your natural self. That extra hour of sleep in the morning doesn't hurt either.